Today was a lovely spring day in London, sunny and warm. I love spring! Another thing I love about spring is asparagus! 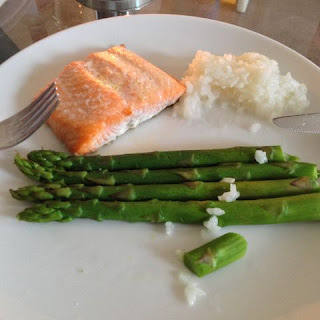 It is perfect for low carb and now it is in season. And it goes so well with salmon, my favourite fish. I always forget to take pictures of my food so here is one of my partner's plate. Mine was without rice but some home-made hollandaise sauce instead. Nuts and seeds are great snacks whilst low carbing. Or are they? Well, they can be! But there are large differences so be careful. I have compiled a list of some nuts and seeds that low carbers can snack on - and some you should avoid. 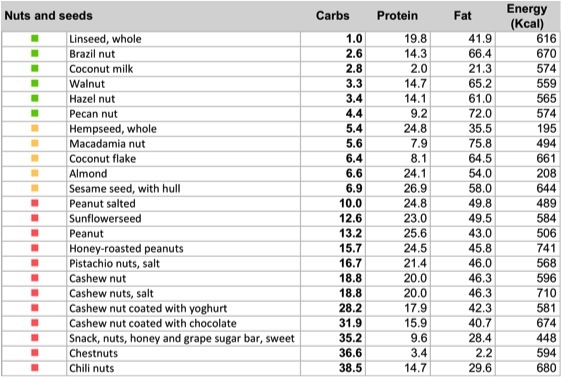 All the values are per 100 g but if you actually eat 100 g you are overdoing it - nuts should be in enjoyed as snacks, i.e. small portions and not en masse since they are rich in calories. Green - Great low carb snacks but beware of calories! Red - These nuts I would not consider low-carb. Avoid.